Before I had written even a single line of 1888, I knew I wanted one of the central characters to be a relative of one of the victims in hopes that, unlike so many other works on the Ripper case, the reader would understand that all five of those women had not existed in a bubble and had people by whom they would be missed. 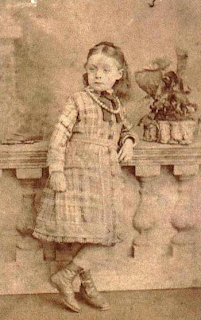 It soon became clear that there was a daughter of one of the victims about whom there was already a rather intriguing mystery - Annie Georgina Chapman, the fifteen year old daughter of Annie Chapman whose whereabouts at the time were unknown. I renamed her Gina for the sake of simplicity; there was obviously already an Annie Chapman in my novel and to complicate things further, a very popular Ripper suspect himself went by the name of George Chapman (this drought of names became a recurring theme throughout my writing process.) By the time I had come to write her, I had become so used to regarding her with the perhaps slightly anachronistic moniker of Gina, that I could no longer imagine her with any other name. Right from the beginning, Gina quickly became my favourite character to write - an ode to those fearless, witty and smart women who I have always admired in fiction, (and have been lucky enough to meet in real life.) She is a girl who is as sharp of intellect as she is of tongue. A headstrong individual with a fierce understanding of justice and perhaps most significantly, a young woman for whom the world holds no fear and no experience, no adventure and no person can overwhelm her. The mystery of Gina's whereabouts concern the autumn of 1888. For a while it was suggested that the young woman had run away with the circus and was now living in France but this unlikely story was denied by her family at the time. A hole in a character's narrative is too tempting a proposition for me to ignore, so my characterisation of her is almost entirely speculation, imaging what if she had stayed in Whitechapel. What would she have done? How would she survive? While the sassy, strident young woman in my novel may seem like a thoroughly modern one, I would argue that my depiction of Gina was probably accurate for a girl of her time. Quite often, we bemoan the fact that children are being forced into adulthood at too early an age. That the pressures to grow are too strong upon the young and that childhood is becoming more truncated with every generation. However, I often wonder if such complaints come from people who have ever considered just what a terrible time childhood would have been in the Victorian era. Most of the children of Whitechapel would have been put to work at a considerably young age. Had Gina been born in the region to a poorer family, she could have been working from as young as ten in some dark, satanic mill or workhouse, and by the age of fifteen, it would not be surprising to have found her married. A girl in her position, without a parent to support her and with only her wits to survive, would have to grow up fast, stay smart and above all else, be incredibly fortunate in order to survive the ravages of Victorian poverty. Whoever Gina was; a scrappy brat, a precocious intellectual or even a girl who ran away to join the circus, Gina Chapman will forever entrance me. Quite simply, I think she's marvellous.